With this year’s dazzling array of hair color ideas, how do you make the crucial hair color decision to take you through the season? First of all, identify your skin-tone and check if you have warm or cool undertones. This is a key point for finding a flattering shade. If you’re planning a big change, consult a professional colorist before you go ahead. It’s worth the cost to find a shade that enhances your eyes, lips and complexion. When you’ve found a new color you like, you can always go back to using a home hair color kit! 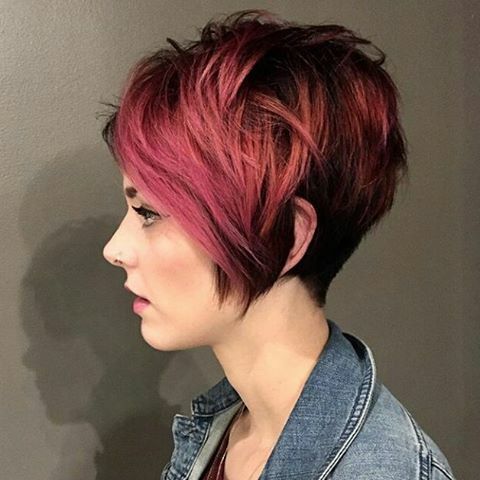 Here is a gallery of trendy short haircuts showcases the most popular new hair-colors right now! 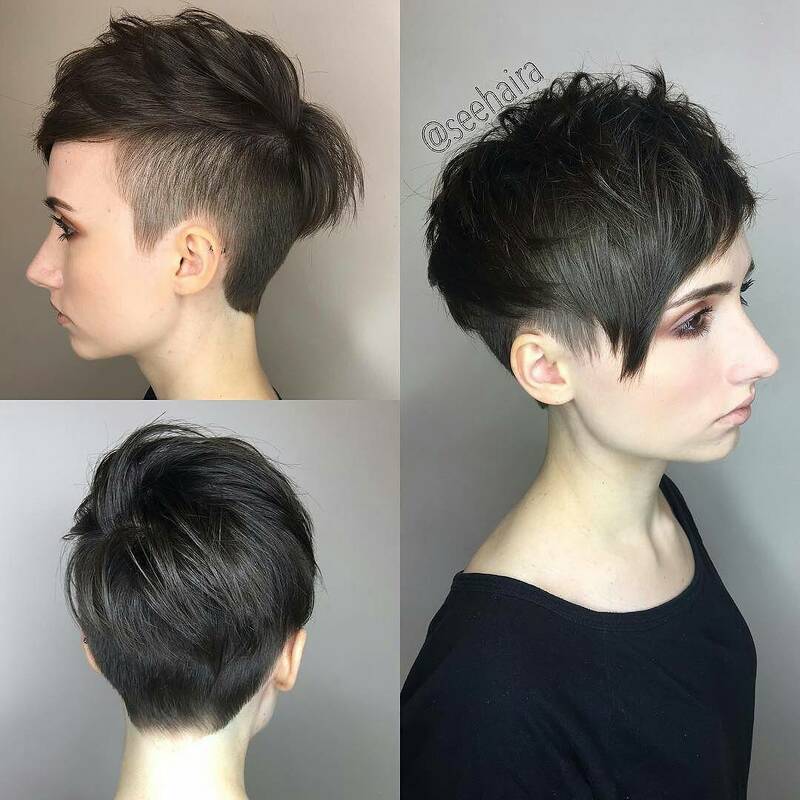 Here’s a boyish, café solo brunette haircut showing how straight, fine/medium hair can be styled for added volume and texture. Both sides have been buzzed short with longer tresses on the top. This means you can sweep your hair to add height and attractive layered texture. 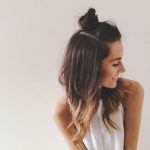 Forward styling is a hot trend right now, but this is a versatile short cut you can constantly change with different partings, quiffs, curls and fringe styles! If you’re planning to update your whole look to a trendy, but easy-care, style check out this fab layered bob. On fine, straight hair with one all-over color, your hair may hang flat, so here’s how to avoid that. Add extra depth from hot fantasy colors, including varied shades of pink, apricot and white balayage over your dark-brown roots. Then give it a tousled, windswept finish! We adore this blended fashion style that takes ideas from fantasy color, edgy tousled texture and ‘street’ razored tips! Raspberry and burnt-orange may be a new color combo for hair color, but as you can see they go together beautifully! And they’ll still suit your complexion when it sun-tans. With natural make-up and a low-key nose-ring, the end result looks well-groomed and trendy! 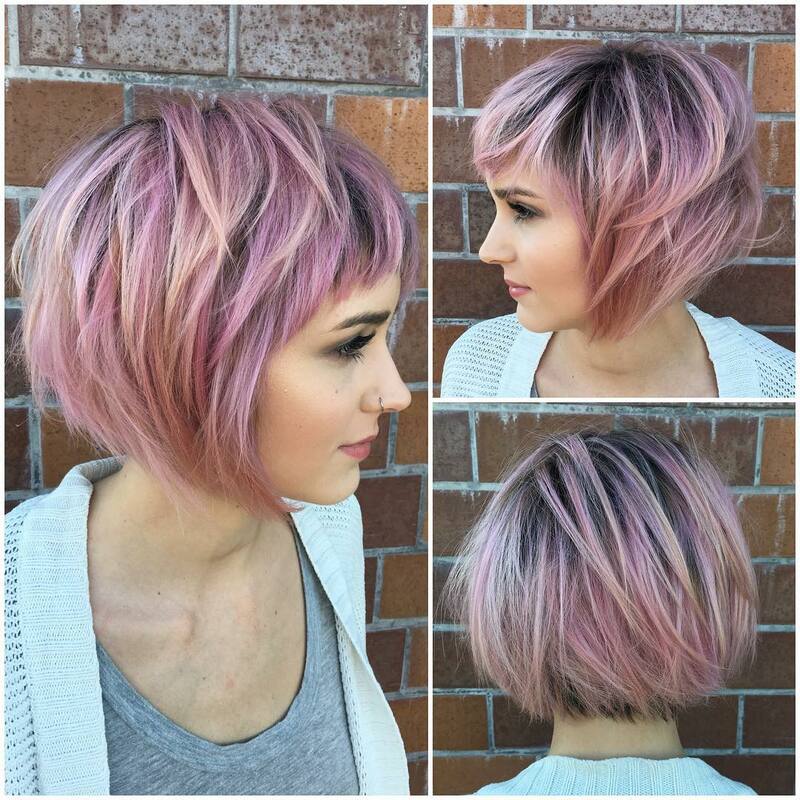 Some workplaces restrict your freedom to experiment with quirky cuts and whacky colors! 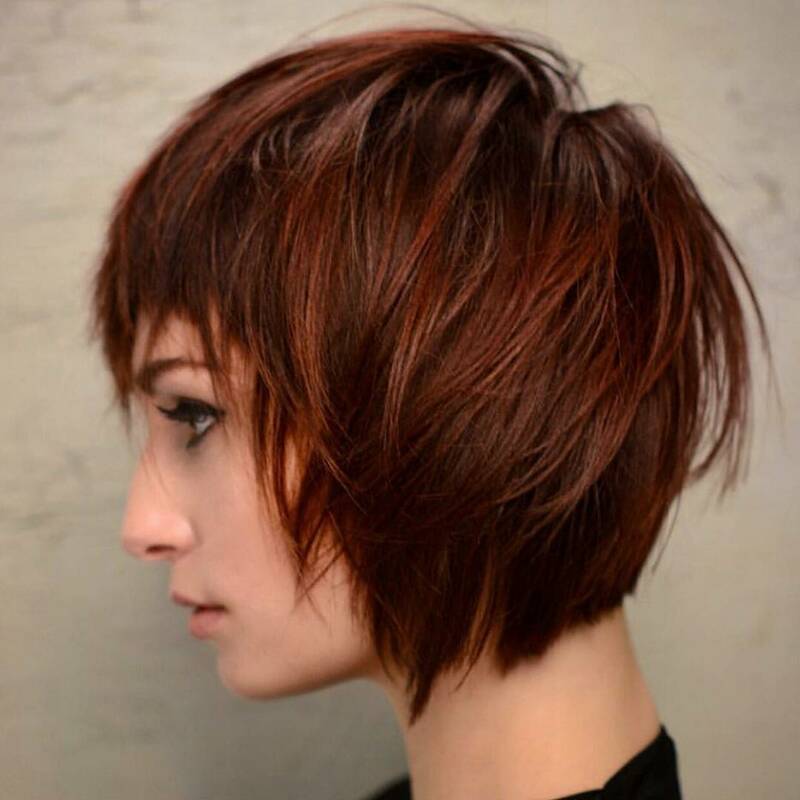 However, looking well-groomed and fashionable is easy with a lightly tousled, straight bob-cut in one striking color. Deep copper red is a classic shade that looks fabulous against dark business-wear, effortlessly blending elegance with a trendy, eye-catching look. On the other hand, women working in the beauty industry and are expected to show us the hottest hair color ideas! I love how this color design plays with the ‘grown-out’ dark roots aesthetic, switching to an unexpected deep, rich purple. 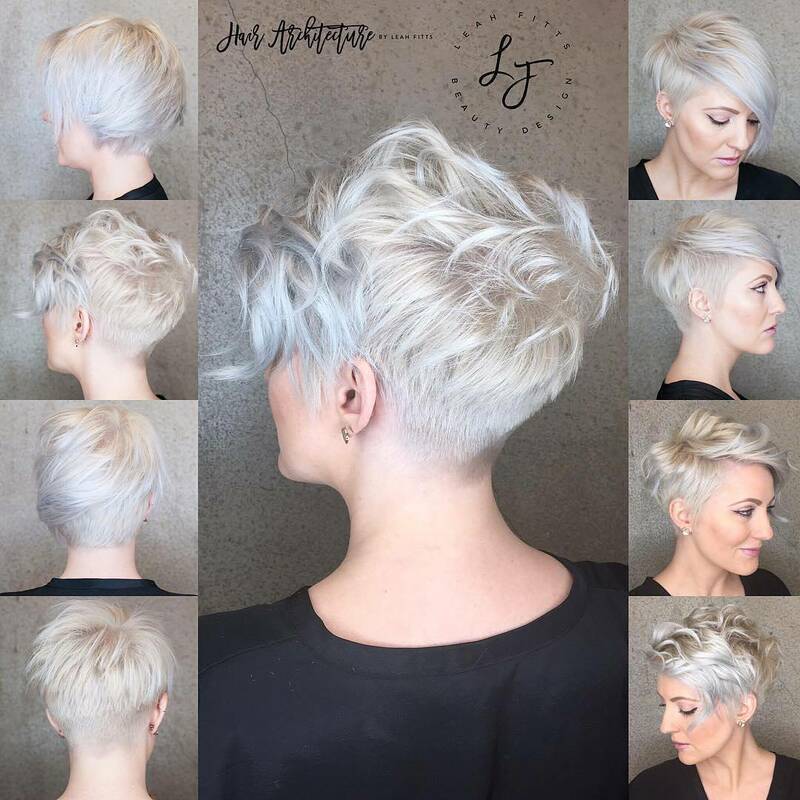 Ash-blonde works well with skin-tones that have warm undertones and always finish off an edgy, cool blonde cut with a harmonized bright lip-color! This classic cut has modern choppiness in the blunt-cut ends, showcasing silky, fine hair. Dual beige-blonde highlights gleam from defined, random twists adding 3-D depth and extra volume. 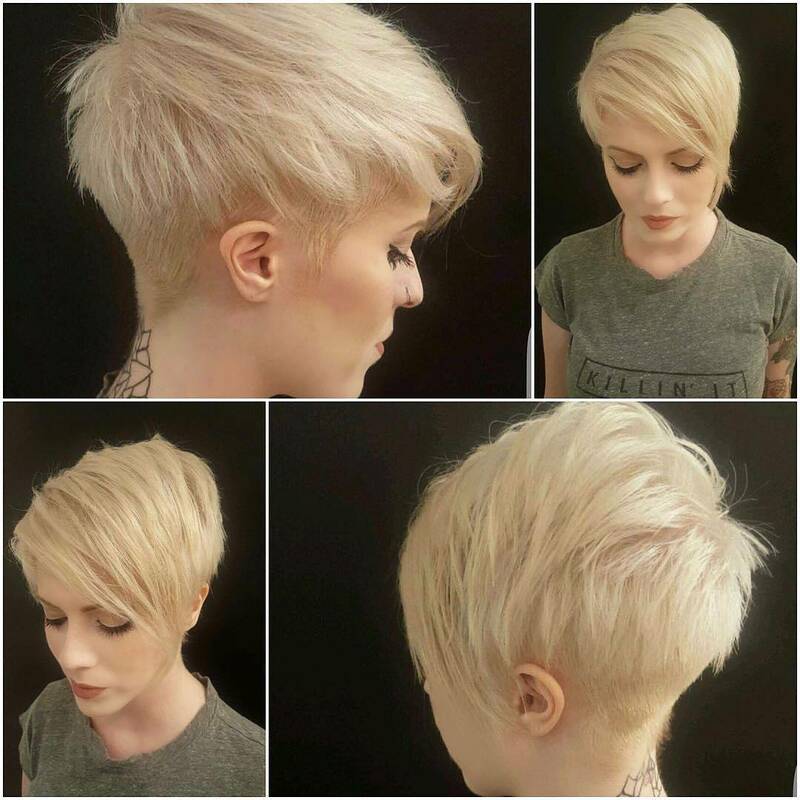 The style can be tousled and casual for leisure, but it’s also suitable for a trendy professional image in eye-catching beige-blonde shades. If you like easy styling and a natural beauty look, this could be just what you need! 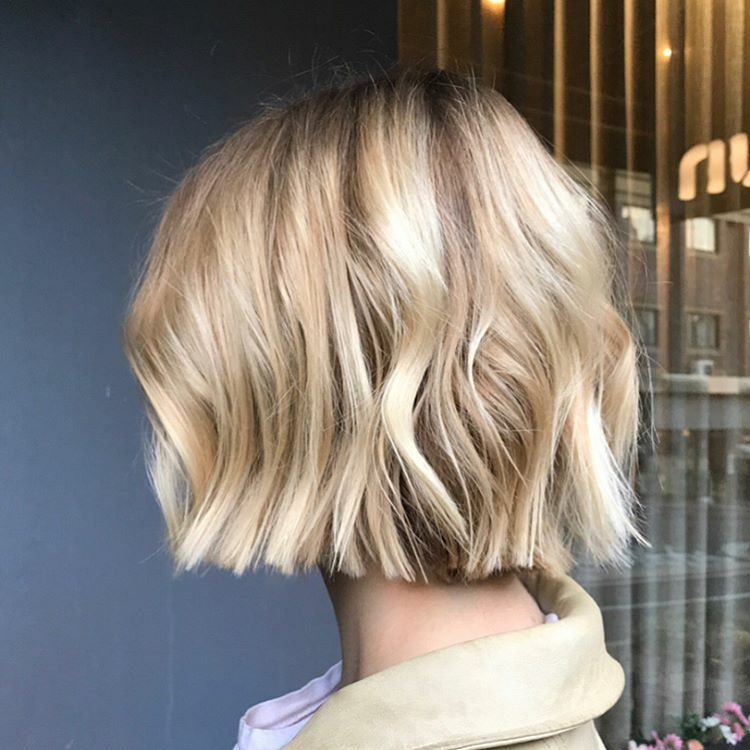 This baby-blonde look is actually a dual-blonde design of ivory and champagne tones, which soften the edgy buzzed back and sides. Champagne is a wildly popular new shade, which suits the pale skin-tones of women who have naturally blonde, fine hair. And you only need a touch of styling product to get lots of lift on top. Pale colors don’t suit olive skin, or skin with a yellow or orange undertone. I’ve only included one undercut with an etched pattern today, but it’s one of those alternative, boho ideas that’s crossing over to mainstream hair-styling! 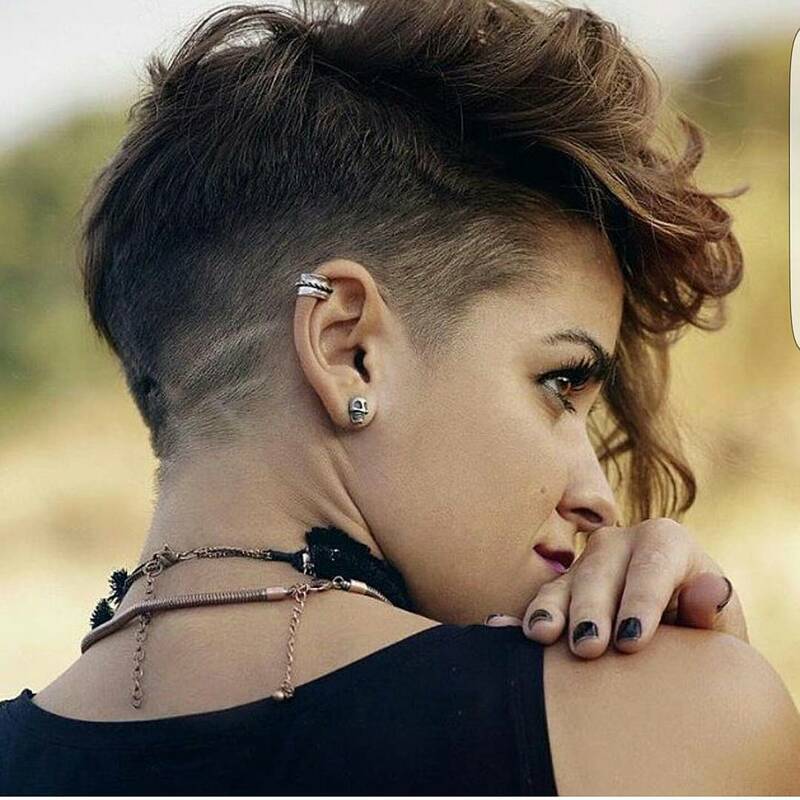 Women with long, medium and short hairstyles are adding a pattern just above the nape – some to highlight a neck tattoo. On longer hairstyles, you can have an undercut pattern that’s cute and shows up under any girly updo! These light colors suit natural blondes with pale skin-tones best. As natural blonde hair is often fine in texture, choosing trendy short hairstyles makes a lot of sense. A shaved back looks much softer on blonde hair and helps to create different layers, textures and color that give the illusion of thicker hair. Champagne and silver show how to create a very modern and fashionable range of special effects! Messy styling has been great for those of us with fine or thinning hair! 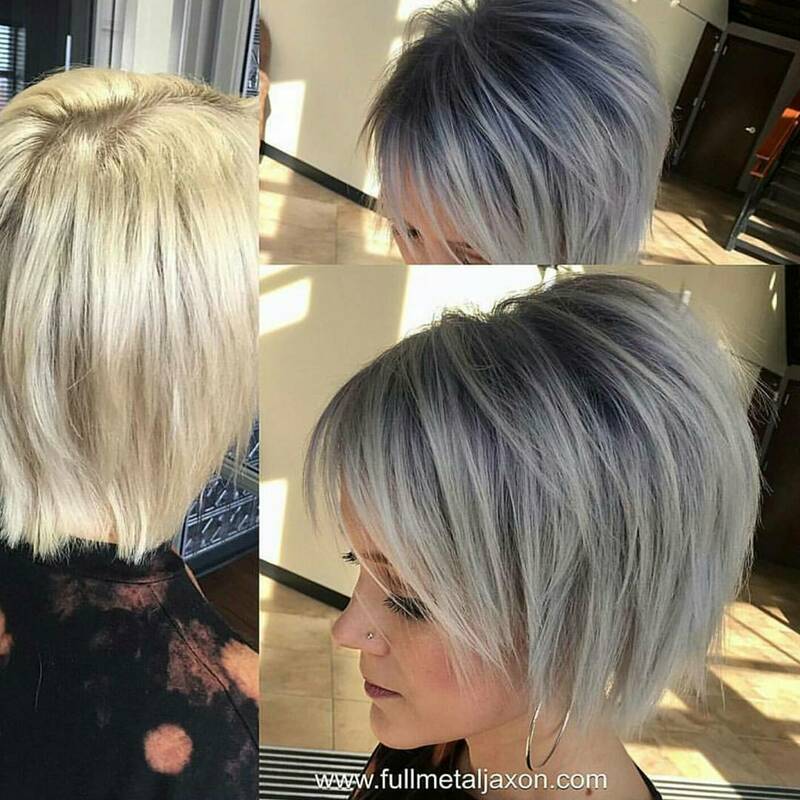 This version of the flattering chin-length bob looks modern and edgy in platinum-blonde, with a touch of blue at the ends. Long layers end just above gossamer-fine tips shaped into the neck and accentuated with blue gloss! With a deep, straight fringe to eyelash-level accentuating the eye-color, this wispy, windswept look is a super-cute hairdo for fine hair! previous post 10 Stylish Pixie Haircuts – Short Hairstyle Ideas for Women Ready for a New Cut & Color!